I’m very interested in astronomy and space so was keen to attend the media preview of Hubble 3D at IMAX Sydney several weeks before the public launch on August 12th. The 45 minute documentary is narrated by Leonardo Decaprio, who relates the background story of the Hubble space telescope and the STS-125 Atlantis shuttle final repair mission to Hubble. The script is pretty simple and clearly aimed at a primary school and lower high school audience. IMAX and NASA have a long relationship of collaborative documentary making, such as the previous IMAX movie Space Station 3D. Since only trained astronauts can be sent to the International Space Station, not professional cameramen, the astronauts were trained to use the giant heavy IMAX cameras to make sure they could use them effectively in space. I wish there was less footage of astronauts and more impressive vision from Hubble such as the great scenes of moving through a starfield, images of the Felix and Eagle nebula and best of all flying through the Orion Nebula – all in 3D. 3D is best when its seen on a really big screen such as IMAX so it completely fills your peripheral vision, compared to a 3D TV at home which is around 1-2 metres in size. 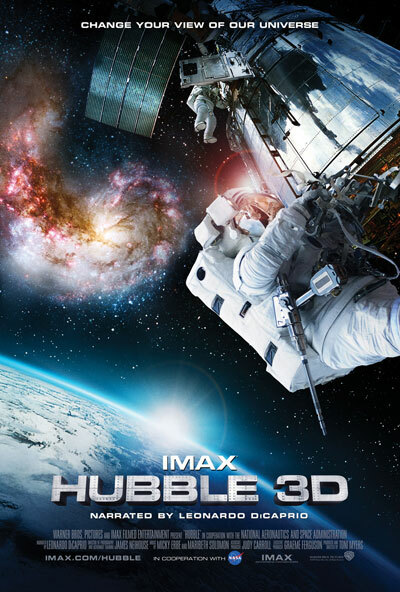 Hubble 3D opens at IMAX Sydney and Melbourne on August 12th. I recommend it for parents who have school age children, if they like it the ABC documentary series Voyage to The Planets is an excellent followup (on DVD from ABC Shops and retailers). Warlach, Fairfax Online and Video Blogger Blunty3000.